We carry a complete line of Braided Packingss as follows. Braided Packingss for All Applications. RAMILON 4586 is an economical packing, ideal for all water pump applications. This is braided from an extremely strong and water-resistant natural fiber. the packing also contains a high level of PTFE due to a comprehensive impregnation process that ensures high density and low friction performance. It's widely used in plunger pumps for high-pressure water applications. AROLAN II 6215 is a universal rotary pump packing, especially suitable for abrasive media and shaft deflection. Made from highly wear-resistant aramide yarn bonded with PTFE, and enriched with a universally stable running-in lubricant, its abrasion resistance and wide thermal and chemical range of applications make AROLAN II a popular replacement for asbestos packings. KOMBILON 6742, an elastic combination braid made from carbon and PTFE yarns, is ideal for rotary pumps and agitators in the paper and chemical industry. Impregnated with a special PTFE compound and running-in lubricant, the unique construction provides a very low coefficient of friction and exceptional resilience, making it ideal for mixer or agitator applications. The packing maintains its elasticity even after prolonged operation and under high contact pressure, and the specially processed carbon yarns ensure excellent flexibility and shaft protection. UNIVERDIT 7000, a compact extruded packing made of PTFE graphite compound, is a special high-density pump and valve packing. It has extremely good resistance to gas permeation and has the ability to embed abrasive particles. It remains self-lubricating even during extended periods of operation and therefore reduces friction on shafts and spindles. Generally it must always be installed with end rings. AROLAN 6210 is a multi-filament aramid yarn with PTFE impregnation and lubricant that has already been used successfully in a wide range of applications. It offers a high level of resistance to wear, particularly where hard crystalline or abrasive media have a destructive effect on the packing. Proven areas of application include media containing solid particles, refiners, juice pumps, slurry pumps, as well as plunger pumps, dryers and mixers. PTFE is bonded to the smooth surface of the yarn in a special pre-treatment process; it optimizes running characteristics, closes leakage paths in the braid and improves adhesion between yarns. A physiologically neutral running-in lubricant assists sealing effect even at low levels of gland pressure. AROCHEM II combination braid consists of aramid yarn and PTFE compound yarn. It's striped yellow/black along its length and seals plungers and low-speed shafts. The PTFE yarn filled with graphite shows very good running qualities and protects the surface of plungers sand shafts. The aramid yarn braided into the corners stabilizes the packing and hinders gap extrusion, thus ensuring long service life. It's particularly suitable for difficult sealing situations such as bridging large sealing gaps and sealing against abrasive media. In high-pressure plunger pumps long operating cycles have been achieved with constant sealing effect through the use of end rings in a precompressed spring packing set. These sealing sets can be supplied as a complete unit ready for installation. AROCHEM 6212 has the excellent running qualities of PTFE plus the tear resistance and minimal tendency to gap extrusion of aramid yarn, which provides a basis for successful application in plunger pumps. It has been successfully used in the sealing of mixers, kneaders and soot blowers. The use of end-rings usually required where PTFE silk packings are applied against high pressures and borderline temperatures is not necessary. This yellow/white packing can be used in an extensive range of applications due to the chemical resistance provided by PTFE silk and aramid yarn. AROCHEM S is rotary pump packing suitable for high shaft speeds and abrasive media. It combines the advantages of two advanced yarn materials in the sealing of high-speed shafts, and the particular running qualities of thermally stable PTFE graphite compound yarn ensure shaft protection and even short-term 'dry running' without damage. Due to their stability, the wear-resistant aramid yarn edges prevent packing extrusion and protects against abrasive media. Arochem S contains a universally stable silicone-free lubricant that ensures superior lubrication during the run-in phase. UNISTAT 6303, manufactured from graphite-filled PTFE yarn, is ideal for control valves and plunger pumps. The high level of graphite ensures excellent heat conduction while the PTFE content provides low friction performance. Due to its dense and pressure-resistant structure it is widely used in plunger and pump application, and its excellent chemical resistance allows for universal use in the chemical industry. UNICHEM 6313 is rotary pump packing ideal for all chemical media. Made from pure PTFE yarn with an additional PTFE impregnation and lubricant, it has a very dense but soft and pliable structure so that sealing can be achieved with a minimum of gland pressure. Due to its excellent lubrication it exhibits very low friction. UNICHEM is also available as a flat tape material for static sealing (dimensions available upon request). UNIVAL 6323 is a universal packing for high speed/high temperature pumps that consists of graphite-filled lubricated PTFE yarn. The special braiding structure provides a low thermal expansion and excellent heat conduction. In addition, this very flexible packing seals reliably with a minimum of gland pressure even against thin liquid media which have a tendency to creep. ALCHEM is manufactured from pure pre-impregnated PTFE yarn. Due to the particularly tight braid structure the packing has limited compressibility, is low in setting behavior and shows a high degree of form stability. Its very low tendency to corrosion, due to an extremely low proportion of soluble chlorides, and its high density, make this a standard packing for use in nuclear power stations. GRAFIFLEX Cover Seals are packing rings for high pressure cover seal applications. They are supplied as preformed rings and offer proven high performance, especially in heavy-duty valves or high-pressure feedwater preheaters, and remain elastic even with fluctuating temperatures and pressures. . Regardless of temperature cycle, this material is not subject to cold flow, shrinkage or aging. It fulfills the purity requirements for seals in nuclear power station valves**. CARBOSTEAM 6550, a high temperature valve packing, is made of flexible carbon yarns and a special graphite-based impregnation. Thanks to its excellent thermal stability, it is widely used in high temperature steam applications, and because of its high pressure and extrusion resistance, it is ideally used as end rings for Grafiflex. CARBOSTEAM S consists of a flexible graphite core with a specially designed wear resistant cover made from pure carbon fiber. As proven in long-term tests, this packing is characterized by good elasticity, good cross sectional density as well as lasting volumetric stability. The enclosing braid is flexible and heat resistant. Running against the spindle is optimized and installation is made easier though the high graphite content of the impregnation. The soluble chloride content of this packing is under 50 ppm, so Carbosteam S is used especially in energy production but also in every industry where high temperatures and aggressive media occur. G-SPEZIAL is made from temperature-resistant flexible graphite strands, which are reinforced with a very thin Inconel wire. This highly pressure-resistant braided packing has the same excellent sealing effect as pure graphite rings wound from band material and pre-molded. In addition, it offers the advantage of a variety of uses in the area of repairs and service. 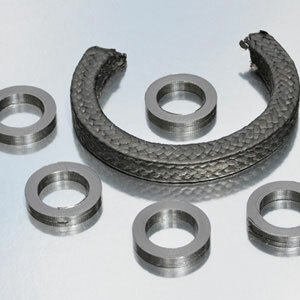 G-SPEZIAL S, braided from expanded pure graphite, is a high performance service packing for pump and valve applications. It combines all the advantages of expanded graphite, such as high temperature stability and cross sectional density. Rings can be cut easily from a roll, thus ensuring a prompt repair service. SYNFLEX 6126 is a wear-resistant pump packing, braided from a synthetic yarn with a grease/graphite impregnation. Smooth running and stability at high temperatures ensure superior performance and a long service life. The bonded graphite impregnation added during the braiding process contributes to the excellent running qualities of this packing. The relatively high melting point of this impregnation ensure reliable performances even at higher temperatures.